Soucy Defense (Soucy) specialises in advanced composite rubber track (CRT) technology for 45m vehicles. This technology is supported by functional analysis design, its own rubber compounding and research and development (R&D) facilities, advanced rubber compound characterisation, modern dynamic simulations, customised production equipment and an automated bench test. Rubber tracks offer high durability and performance, as well as low lifecycle costs for tracked vehicles, and can be adapted to suit any specific requirement. 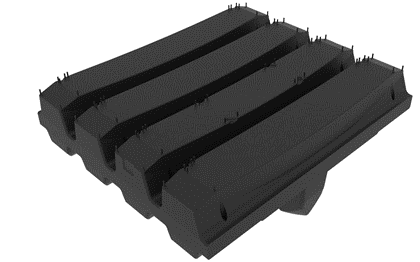 This ductile composite rubber track technology can be customised to meet a wide range of requirements using advanced rubber compounding and computer simulations. Rubber tracks have many advantages over traditional steel tracks. The first is weight reduction. Typically, this represents roughly half of the steel track weight. 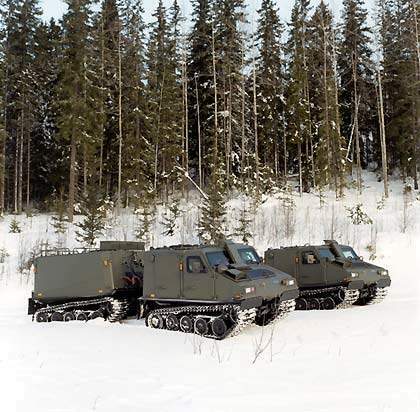 For example, a 39t CV90 vehicle saves nearly 1.3t by replacing the T157I steel track with Soucy’s rubber track. 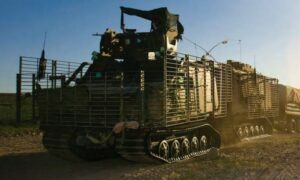 For vehicles subjected to weight limitations such as the mobile protected firepower (MPF), the rubber track is an alternative solution. Rubber tracks also reduce the vibration level by up to 70%. 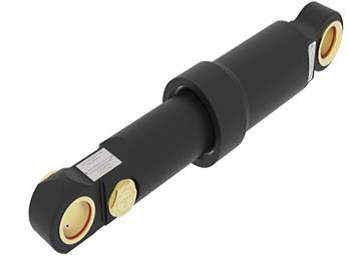 This reduces crew fatigue, wear and tear on electronics, and ammunition insensitivity. They also decrease noise levels up to 13dB, which improves crew health and safety, as well as mechanical condition awareness. Communications become more efficient and mechanical issues can be predicted or quickly diagnosed. The vehicle also becomes much stealthier. The combination of reduced noise and vibration levels with the smoother ride provides lower rolling resistance at higher speeds. At a vehicle speed exceeding 32mph, rubber tracks typically provided a rolling resistance reduction of up to 50%. This reduces wear and tear of the engine, transmission, and final drives. The reduced rolling resistance obviously translates into reduced fuel consumption (L/km), leading to an improved, more cost-effective vehicle range. When considering fuel economy and track durability, rubber tracks usually provide cost reductions of 25% over traditional steel tracks. In addition, man hours are reduced by 53 hours of maintenance per 1,000 miles travelled. Many mine blast tests have revealed that rubber tracks can withstand a typical anti-personal mine (240g of TNT), whereas traditional steel tracks will separate and create projectiles that worsen mine effects. In the event that the rubber track would separate and the vehicle is still serviceable, a rubber track repair kit is available. Rubber tracks for heavy vehicles have seamless continuous belting, on which one centre guide lug is located to stabilise the track. See Image 1 below. 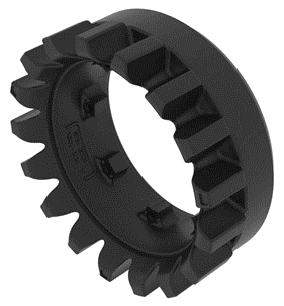 To transfer torque from the sprocket to the track, two drive lugs are located on each side of every track pitch. Contact with the ground and soil traction is insured by the rectangular-shaped external profiles. To sustain stress, each component is strategically reinforced. One important material of a composite rubber track is of course, the rubber compound which represents roughly half the track weight. 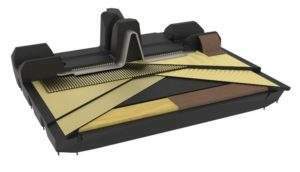 Overall, a composite rubber track is made of more than 12 distinct rubber compounds, each having different mechanical properties, one of which is the Soucyprene, a Soucy Trade Mark, offering a wear rate of 20 times less than the conventional natural rubber compound. 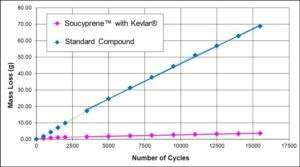 The chart, as shown in Image 2 below, demonstrates that the Soucyprene offers a wear rate of 20 times less than conventional natural rubber compound (e.g. steel track rubber pads) in a laboratory abrasion test. Throughout 30 years of research and development (R&D), Soucy’s evolution through the vehicle types and weight classifications is evident as we continually strive for improvement and excellence. Since the official validation of the 39mT product line, Soucy have been developing new and improved 50mT vehicle rubber track technology. This technology will be realised in the very near future, giving Nations of heavier vehicle weight categories the opportunity to experience the advantages of Soucy’s CRT. 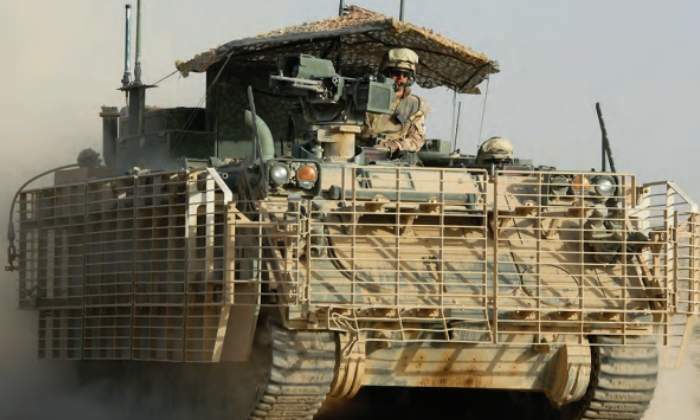 Soucy Defense have been manufacturing composite rubber track for defence and security sectors for over 30 years. The company creates solutions that meet the highest requirements approved by military forces worldwide and are proven in battle conditions during domestic and expeditionary operations. The group has a diverse set of engineers who work closely with our customers to find innovative high-performance and sustainable solutions to meet their track system requirements, whilst minimising production costs regardless of the scale and complexity of the project. With so many years of experience within the military sector, Soucy has gained a wealth of knowledge on differing vehicle weights and configurations. This allows for customers to purchase an ‘off-the-shelf’ package or a bespoke package designed for their individual needs. At Soucy, we are committed to meeting our clients’ requirements and providing products and services that exceed their expectations. We are constantly improving our processes and our products, striving for excellence in everything we do. 3D scanner: a tool allowing three-dimensional reconstruction of a vehicle to facilitate the analysis and development of products that are perfectly adapted to it. Modelling and finite-element calculation using the Abaqus software. A prototyping and modelling workshop allowing the production of a first prototype very quickly. Howe and Howe Technologies have produced a lightweight tank with a speed exceeding any competing land-tracked vehicle. They have implemented the use of Soucy CRT track system within their design. Additionally, refer to Image 3 below. 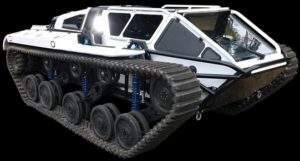 Soucy Defence Division will exhibit their world-leading Composite Rubber Track (CRT) from the Canadian Pavilion at IDEX 2019. 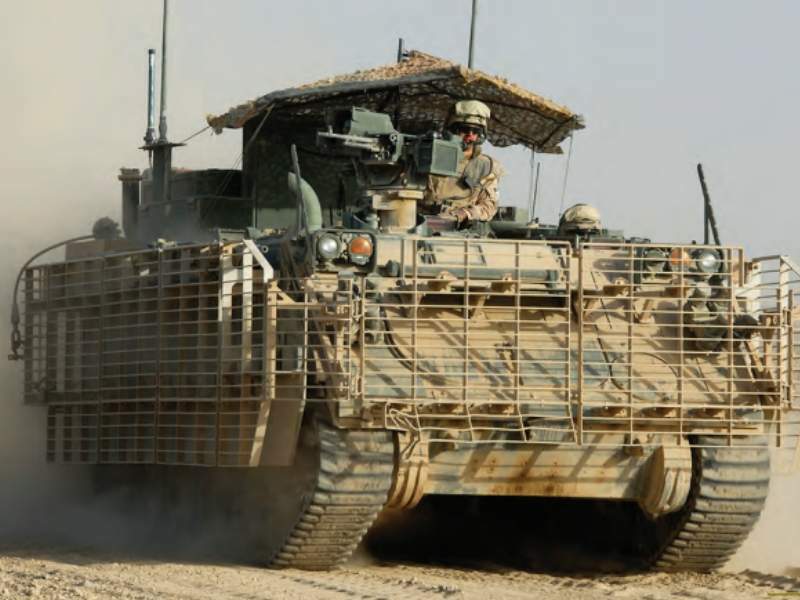 Soucy has an operationally proven system serving in conflict theatres such as Iraq and Afghanistan on Canada's M113, the UK’s BVS10 (Viking) and Norway’s CV90 vehicles. 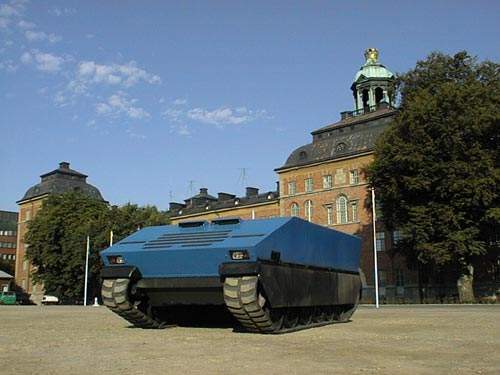 CRT has been fitted to Armoured Vehicles (AVs) since 1988 and is currently integrated on several different platforms such as M113, CV90 and BRONCO. Composite Rubber Track (CRT) is the most significant technological development since the invention of armoured tracked vehicles. 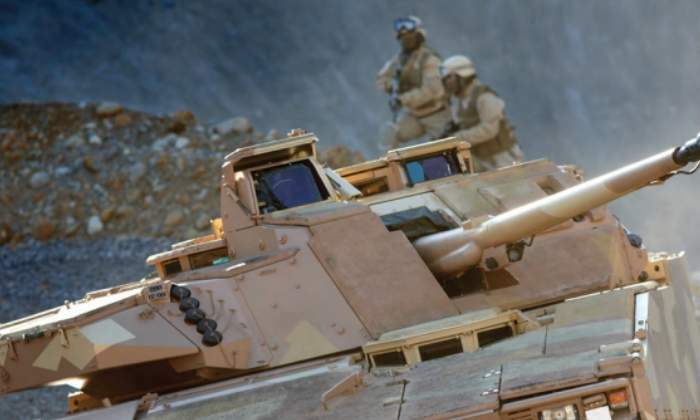 Soucy technology is revolutionising the development of tracked vehicles by delivering multiple strategic benefits and optimising equipment performance. To accommodate the diverse weight classification portfolio of CRT integrated armoured vehicles (AVs), Soucy provides not only the track but a full track system. Depending on the vehicle weight will depend on the sprocket that is provided to accompany the CRT. As the longitudinal stiffness of CRT is higher than ST, Soucy has designed a Collapsible Tensioner (CT) to prevent any damage to other running and suspension components. The CT is designed to collapse at a pre-set tension, which would normally occur when there is an ingress of rocks and debris between the tracks, sprocket or Idler wheel. Militaries worldwide are increasing their Research and Development (R&D) into RAS. Within the next 10-15 years RAS could potentially be at Military Commanders behest and play an active part on the complex future battlefield. With the advantages of Soucy's CRT already widely known on manned vehicles there is already an instilled confidence in the minds of Original Equipment Manufacturers (OEMs) globally to use our proven product on RAS. Viking (BvS10) is a fully amphibious armoured all-terrain vehicle, which consists of two tracked vehicle units linked by a steering mechanism. AUSA Annual Meeting has been running for 30 years and is the largest land power exposition in North America. The 2018 edition presents a wide range of industry products and services with more than 700 exhibitors, and proposes Army leader interactions with presentations, panel discussions, seminars and networking events. Our Defense Division is exhibiting our Composite Rubber Track (CRT) system in the Canadian Pavilion Hall F, booth F-25, at the annual show in Kielce, Poland, between 4-7 September 2018. For the first time, our Defence Division will be exhibiting our Composite Rubber Track (CRT) system at the bi-annual LAND FORCES 2018 trade show held in Adelaide, Australia, between 4-6 September. The Soucy Defense team will be at EUROSATORY 2018 showcasing the Wiesel. Soucy Defense are moving forward with their Research and Development (R&D) of heavier-weight vehicle classifications. Soucy Defense will be attending the Michigan Defense Exposition (MDEX) on the 25-26 April (Booth C16) where their Business Development (BD) teams will be happy to discuss the UK trial. Soucy Defense have recently trialled our Composite Rubber Track (CRT) on the UK MOD's WARRIOR vehicle, weighing 26mT with great success.